When you boil it down, there are really two basic types of open space in a city: public and private. 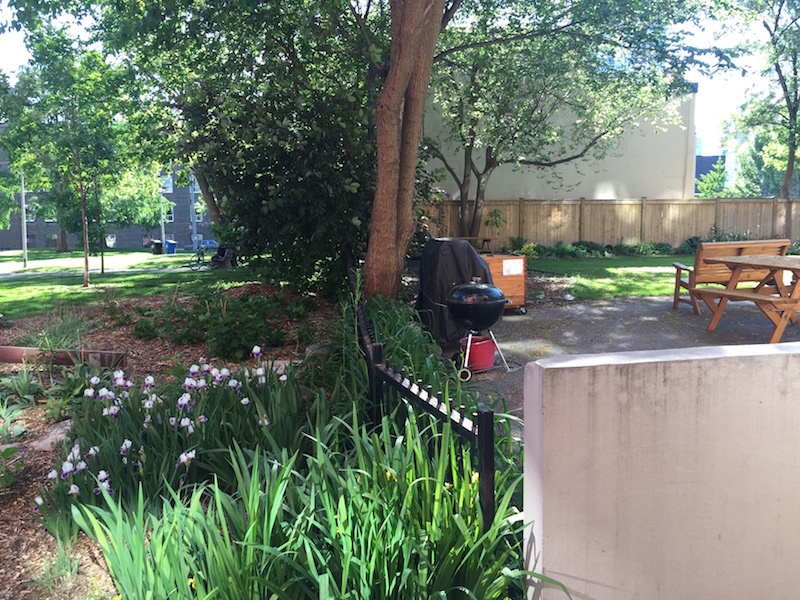 You’ve got your beaches, ravines, parks, and plazas on the public side, and your front yards, apartment lawns, walkways, and courtyards on the other. Of course, nothing in a city is ever as clear-cut as that. 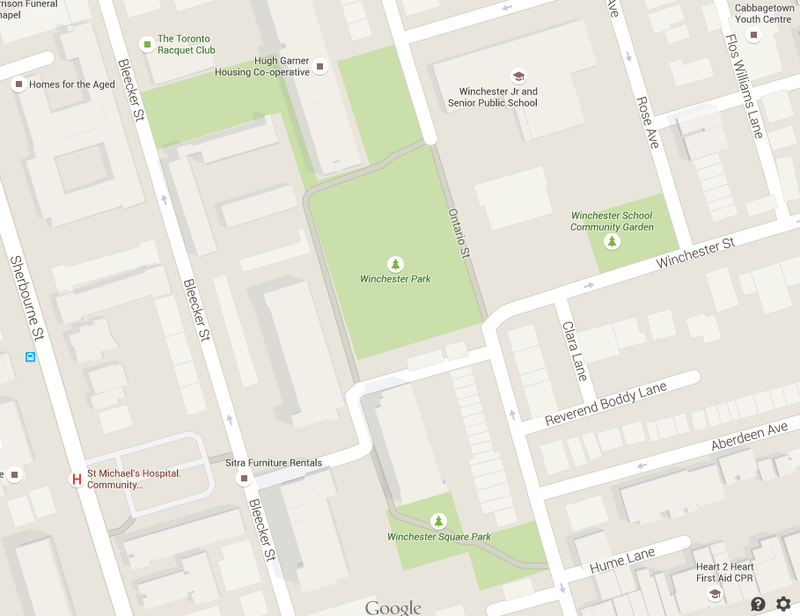 The several small parks that make up the block where Winchester Park is located in Toronto’s Cabbagetown neighbourhood (Ward 28) creates that same feeling of blended public and private spaces. It consists of four (I think) public parks set amidst several housing complexes that also have their own (private) spaces that are all connected by various internal walkways that are (I think) private. One of the two small parkettes that make up Winchester Square Park (south of the bigger park) contains some raised bed gardens and is very clearly a public park. 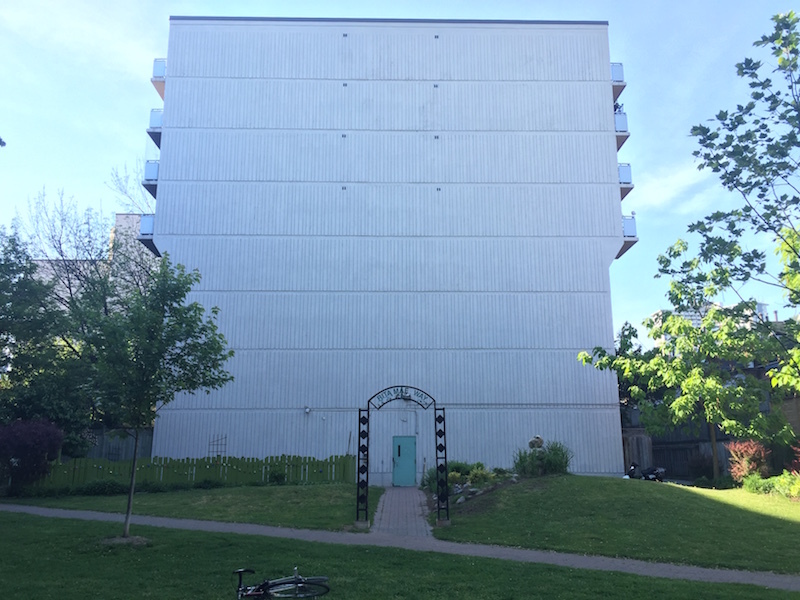 But the second space is a less defined green space that seems more like a private yard for the adjacent apartment building, whose towering blank face rises above the park, begging to have a mural painted on it. There’s even a small garden that borders the park with a green picket fence, but is (I think) a private garden of the building. 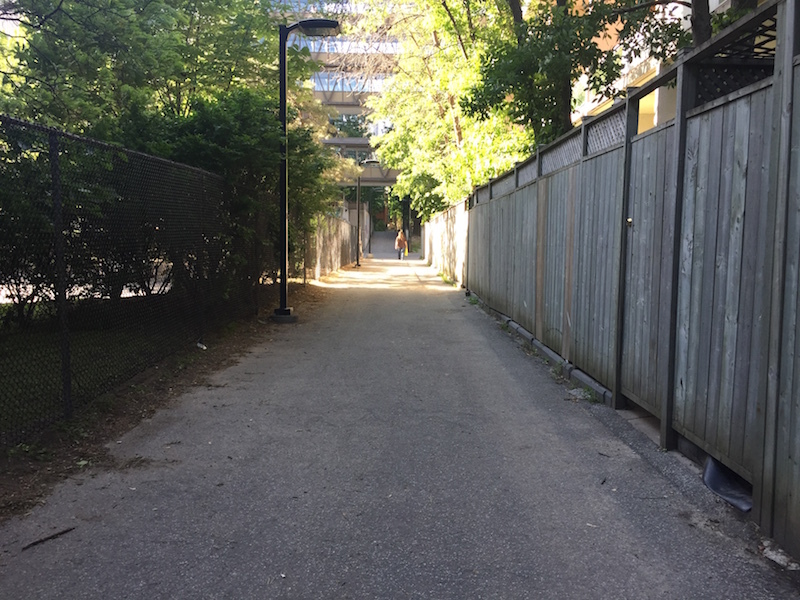 You can follow the pathway in these parks to get to a walkway/alley that leads up the centre of the block and connects you to two other parks, but also acts as the main path between several housing complexes, including the Hugh Garner Housing Co-op. Here is where things get a little bit murkier as it becomes less clear what is private and what is public space. There are a number of variously-sized pathways leading off in differeent directions, including some very narrow ones that border a park. 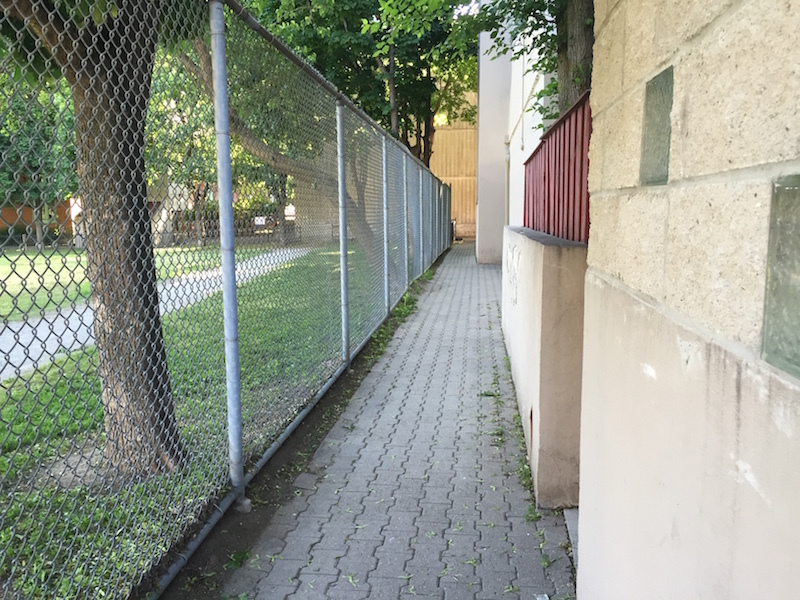 Sometimes a fence separates two communal open spaces, one private (right) and one public (left) so there’s no room for confusion. The largest green space in this area, Winchester Park, is just a big blank grassy space with a dirt running track around it. 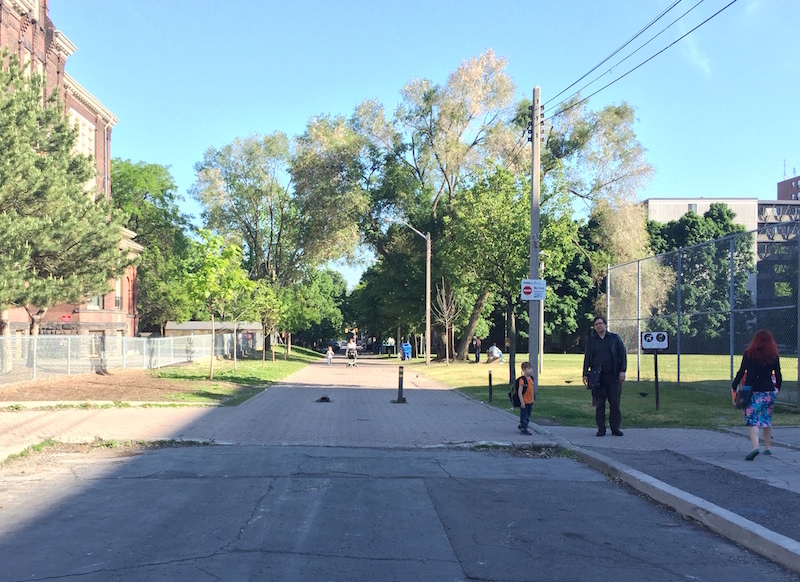 It’s bordered by Ontario Street, which ceases to be a street and becomes a pedestrian walkway instead. 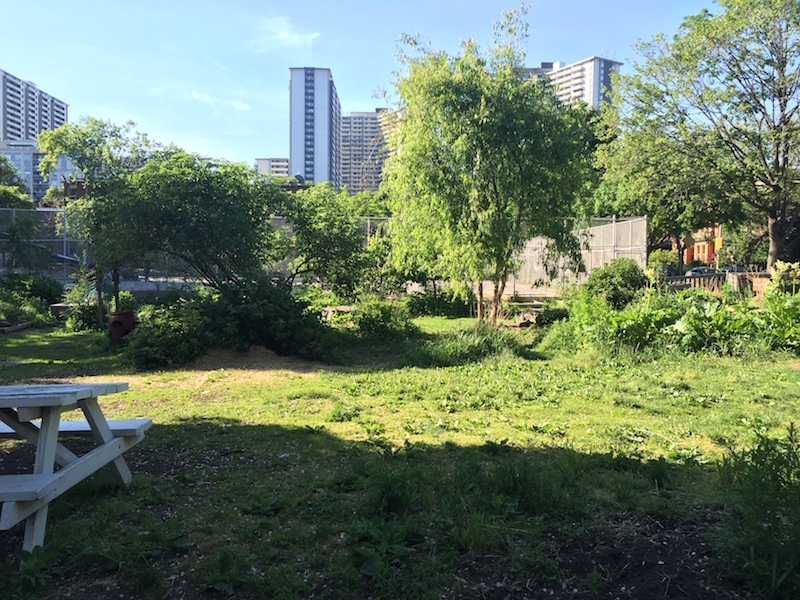 To further complicate the public/private spaces matter, a short walk away there is a really lush and beautiful garden space that is part of a nearby school. There is a fence around it with a gate that was open, but it wasn’t clear whether anyone could just walk in and enjoy the garden so I stood outside the fence and took pictures, which maybe is even more creepy than just walking into the space, but there you go. 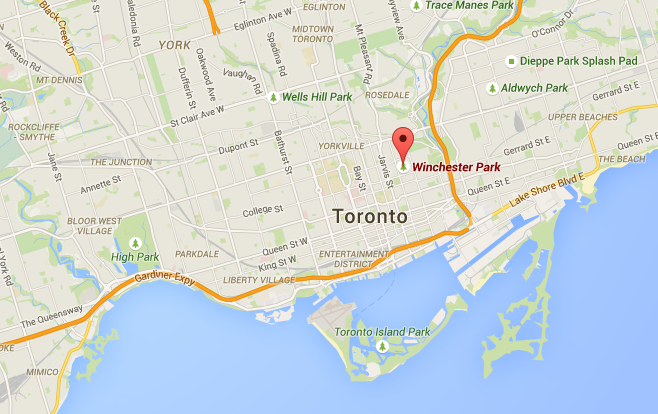 All of this is interesting in the context of another space just north of Winchester Park: St. James Town. Here, private high-rise housing developments are clustered together around a meandering system of roadways, parking lots, and open spaces–both private and public. It’s almost impossible to tell which is which. In fact, the lack of distinction between private and public open space is one of the points people now criticize about older housing developments of this kind. When a space seems neither public nor private, who takes care of it? How do you use it? In the end, the experience of walking the block around Winchester Park is not uncomfortable (it’s actually quite pleasant with all the pedestrian walkways going everywhere), but there are a few moments where you think to yourself: am I supposed to be walking here? Where does this actually go? You feel a bit at times like you are trespeassing, and maybe that’s because you are, without even knowing it. Special thanks to local Ward 28 resident Cameron who accompanied me on this walk.